Who thinks Reggie Jackson shouldve went in the hall as an Athletic and not a Yankee? He started off his career as an Athletic. He played for the Athletic for 9 years compared to the Yankees with only 5. He won 3 World Series as an Athletic compared to 2 with the Yankees. He hit 254 homeruns as an Athletic compared to 144 as a Yankee. He has 6 all star appearances as a Athletic and 5 as a Yankee.... show more He started off his career as an Athletic. He played for the Athletic for 9 years compared to the Yankees with only 5. He won 3 World Series as an Athletic compared to 2 with the Yankees. He hit 254 homeruns as an Athletic compared to 144 as a Yankee. He has 6 all star appearances as a Athletic and 5 as a Yankee. Most of his career and his accomplishments were in a Athletics uniform than any other team he played for. Take away those 3 homeruns he hit in the World Series in that last game with the Yankees and he is nothing special. Do you think he shouldve went in the hall of fame wearing an Athletics cap? if he never had the choice to pick what team he wouldve went in as, would the hall of fame choose him to go in as an Athletic? After all, his plaque is a Yankee uniform. Should the cap in the plaque just go to where ever they played the longest? Update: Why did Reggie Jackson go in as a Yankee? Best Answer: At the time of his election it was still the player's choice as to which cap to wear. He was employed by the Yankees so it made sense to go in as a Yankee. Now, the Hall of Fame decides which cap the player will have. They most likely would have put Reggie in with the A's. Personally I think everybody makes too big of a deal about the cap. 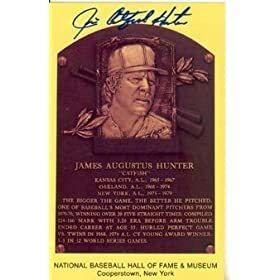 They should just put everybody in without a hat or a generic hat like Catfish Hunter did. When he was inducted, it was still the choice of the player and the Yankees were the ones who gave him all of his money. Any time a player has to select a team between the Yankees and someone else, they always pick the Yankees. Mr. October! the 1st time i actually knew him by making use of that call became as a Yankee so i might could desire to declare, as a Yankee! I wasn't sufficiently old to truly comprehend plenty approximately him however the 1st poster I ever observed became him in a Yankees uniform. I agree but it was his choice and there is more money to be made in memorabilia sales from being a Yankee then being an A. Personally, I think he should have gone as an Athletic or an Angel. The "A" on either hat could stand for "@sshole," which is what I associate with him more than any one team. Charlie O wouldn't pay him and Steinbrenner and New York treated him like he wanted to be treated, he was a primadonna. In Oakland, it was team first. Is Reggie Jackson more memorable as a Yankee or an Oakland Athletic? Reggie Jackson told to stay away from Yankees indefinitely. your thoughts plus story inside.->? Reggie Jackson and the 1977 NY Yankees? Reggie Jackson in an interview said the following players don't belong in the Hall Of Fame. Agree or disagree? Do you think players like Reggie Bush, Desean jackson, went to class? Why is the new york yankees banning god bless america from the late kate smith? i don't see any racial lyrics in the song?